We get asked frequently about what belongs on a top 10 penny stocks to buy list. So we made one. Penny stocks – shares priced for $5.00 each or less – can be very good investments. They are also highly volatile. Many penny stocks are micro caps whose businesses are engaged in research and development. The micro cap's share price may be based on the fact that sales and revenue have not yet begun, or have not begun significantly. They may be in markets where they have first mover advantage or are developing a product for markets projected to grow strongly. The net result? Investors interested in the top 10 penny stocks to buy need to be aware that volatility means the share price can go down significantly as well as climb. 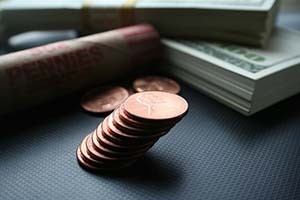 There are two ways to insure yourself against the price swings of penny stocks. The first is to make sure you have good risk tolerance. If the thought of your shares losing altitude keeps you awake at night, perhaps the top 10 penny stocks to buy are not for you. If you enjoy playing cutting-edge products and markets and feel that climbs and dips are part of the stock market experience, they are for you. Also, insure your portfolio against swings. Money Morning Chief Investment Strategist Keith Fitz-Gerald recommends that investors never place more than 2% of their total investments in one penny stock. Penny stocks should constitute only a small percentage overall. Also, be sure to research any penny stocks you are interested in. Know their financial picture. Read the annual report and the 10-K. Understand what the products are and what their outlook is. Top 10 Penny Stocks, No. 10: TetraLogic Pharmaceuticals Corp. (Nasdaq: TLOG) is involved in researching and developing small molecule therapeutics. It has a product, Birinapant, intended for myelodysplastic syndrome (MDS) in phase 2 clinical trials now. It is also developing a therapy for alopecia areata. Top 10 Penny Stocks, No. 9: Frontier Communications Corp. (Nasdaq: FTR) is part of a somewhat rare breed: The penny stock with a great dividend yield. The yield at the current share price of $5.12 is a strong 8.59%. Connecticut-based Frontier supplies data, voice, and video services to customers that include businesses, residences, and wholesale concerns in the United States. Top 10 Penny Stocks, No. 8: Fuel Cell Energy Inc. (Nasdaq: FCEL) is one of the Money Morning  top 10 penny stocks to buy because it makes hydrogen fuel cells that are needed due to the Unstoppable Trend of energy consumption. Several weeks ago, FCEL reported that it had signed a partnership agreement with Exxon Mobile Corp. (NYSE: XOM), a very good development for investors. FCEL will be developing technology to cut down on carbon dioxide emissions from XOM's facilities with high emissions levels, including natural gas power plants. Carbon dioxide emissions cause greenhouse gases, one of the major factors behind global warming. Investors in FCEL will be investing in a play on green energy. Top 10 Penny Stocks, No. 7: GigPeak Inc. (NYSEMKT: GIG) (formerly known as GigOptix) provides advanced semiconductor communications components that its customers deploy in cloud connectivity, high-speed optical and wireless networks, and data centers. In the first quarter of 2016, it reported that a premier worldwide technology distributor, Avnet, had come on board as the distributor for GIG's sales in China, for all GIG's product lines. Top 10 Penny Stocks, No. 6: GlobalSCAPE Inc. (NYSEMKT: GSB) is another penny stock with a dividend. The current yield is 1.80%. It's especially noteworthy because GSB is in a fast-growing sector – products for secure exchange of information – and is a very fast-growing company within it. In 2014, San Antonio Business Journal named it to their Fast Track list, which is limited to enterprises with more than $10 million in revenue who are among the fastest growers of revenue in the area. Top 10 Penny Stocks, No. 5: Lucas Energy Inc. (NYSEMKTS: LEI), an independent oil and gas company, is expected to benefit from the Unstoppable Trend of energy as well. Fitz-Gerald expects demand is to be strong through 2016. Top 10 Penny Stocks, No. 4: The Swedish company Neonode Inc. (Nasdaq: NEON) is poised to be a beneficiary of the trend toward touch screens for tech devices. Neonode's products change the regular surfaces of tech devices – including smartphones, laptops, PCs, GPS, and wearable devices – into touch screens. NEON has announced agreements indicating strong demand in 2016, including a recent one from Lexmark. Top 10 Penny Stocks, No. 3: Novavax Inc. (Nasdaq: NVAX), one of  Money Morning's top biotechnology stock picks, researches and develops vaccines, including those for pandemic flu viruses. It announced research into Zika virus and Ebola virus vaccines earlier this year. The potential for its vaccines makes it one of the top 10 penny stocks to buy. Top 10 Penny Stocks, No. 2: STMicroelectronics NV (NYSE ADR: STM), is one of the top 10 penny stocks to buy because it is one of the four leading players supplying chips to the automobile business. Over the next decade, the global market for self-driving car technology is forecast to climb to $42 billion. By 2035, it is expected to be a $77 billion market. STM is expected to be along for the ride in that burgeoning market. Top 10 Penny Stocks, No. 1: Ekso Bionics Holdings Inc. (OTCMKTS: EKSOD) is engaged in the research, development, and sale of exoskeletons – wearable armor that people who have mobility issues can don. The armor enhances the mobility of the disabled, soldiers, amputees, and people who are paralyzed due to strokes and spinal cord injuries. As such, it participates in the human augmentation market, which Fitz-Gerald lists as one of the Unstoppable Trends for the future. Unstoppable Trends are broad societal and economic trends that make markets robust. Fitz-Gerald forecasts growth for the human augmentation market to hit $1.8 billion in four years, a whopping 4,000% increase. Ekso recently underwent a 1-for-7 reverse stock split, as part of the process to be listed on the Nasdaq Capital Market rather than the OTC markets. If its Nasdaq application is successful, it's good news for investors, as the broader markets have more stringent reporting requirements and regulations. The broader markets tend thus to attract more investors, which can provide a floor for the stock price. And that's the entire roll call of the top 10 penny stocks to buy! For more on one of our favorite penny stocks to buy, check out our free report: This Penny Stock Will Double Your Money — and Save a Dying U.S. Industry.